We’d love your help. 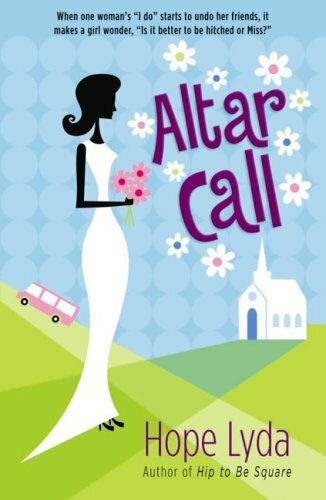 Let us know what’s wrong with this preview of Altar Call by Hope Lyda. In this fun and clever sequel to Hip to Be Square, heroine Mari Hamilton discovers how a wedding, even someone else's, can turn rational women into irrational creatures. To ask other readers questions about Altar Call, please sign up. Very easy and light read. This book is about a 30 single Christian woman dealing with friends and family and relationship struggles. A fun, summer read. The sequel to Hip to Be Square is as funny and as much of a page turner as the first book. I thoroughly enjoyed this conclusion to the series and the surprises it brought. A celebration of life, faith, friendship, family, God's calling for your life, and a touch of romance thrown in as well! Great book! It was fun and entertaining in the beginning,middle and i liked the guy marcus. But the end could have been a better happy ending. example.marcus and mari could have hug and held or even kissed each other. Isnt that what happy ending couples do.That they finally togerther.....again. This is the 2nd in a series about Mari and her life as a "cruise director" for a retirement home plus the craziness of her friends and her beau Beau. She has to deal with her father's illness and reliving memories of living back home (both good and bad) and how that has impacted her life. I really battled to get past the way she writes. In the whole book, the characters never use contractions (we're instead of we are) and the conversations often felt stilted to me. It took me about 100 pages in for me to start overlooking that and then I started enjoying the book. As a Christian, some good lessons about listening and obeying God. Liked it. Didn't love it. Was heavy handidly realistic for chick lit at certain points and then off in the clouds fairy tale romantic at others. A nice read, but not great. took forever to finish as it was a boring and forgettable read. Was good...weren't sure where it was going until towards the end. I truly loved this book! More from me on this book later! This review has been hidden because it contains spoilers. To view it, click here. This love story was soooo cute. I was rooting for marcus the whole time. I couldnt help but smile as I read and identified with Mary. Took awhile to get in to. Started off very choppy. Hope Lyda has worked in publishing for ten years and is the author of Hip to Be Square in addition to several nonfiction titles, including the One-Minute Prayers series (more than 200,000 copies sold). When not journaling or aspiring to write and travel, Hope enjoys her work as an editor and living life in Oregon with her husband.